Units hold 42 to 56 1/8# hot dogs and 30 to 40 buns. Standard size hotdogs ONLY - larger (plumper) hotdogs do not work in cages. With the heat control set on "HI" and using average size hot dogs it will take from 10-15 minutes to have the hot dogs ready for 140° F minimum serving temperature. Watch the dogs carefully the first several times you cook to avoid blistering or burning the hot dogs. After the hot dogs are cooked reduce the heat control setting to one which will keep the hot dogs at the 140° F minimum serving temperature. Hot dogs can be kept on the rotisserie for several hours without shriveling or loss of flavor, if the heat control is properly set. 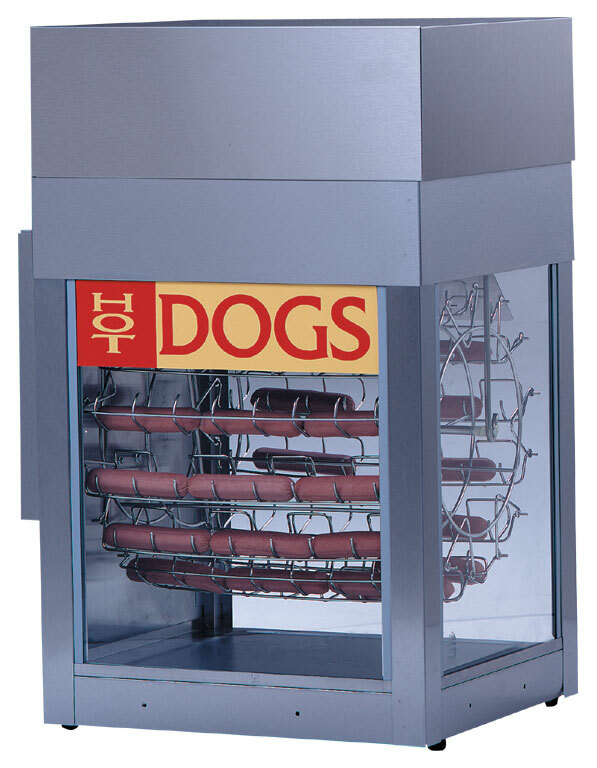 * Please call us with any questions about our hot dog rotisserie rentals.